Malta is regarded as one of the worlds best diving destinations! Lying by the pool and getting your tan topped up is all well and good when you’re on holiday. But what can you get up to when you want a little bit more than just a dip in the pool to cool off? Luckily for Chevron Holidays guests at the Preluna Spa & Hotel, there’s the chance to make a splash and take part in some of their fantastic water sports. 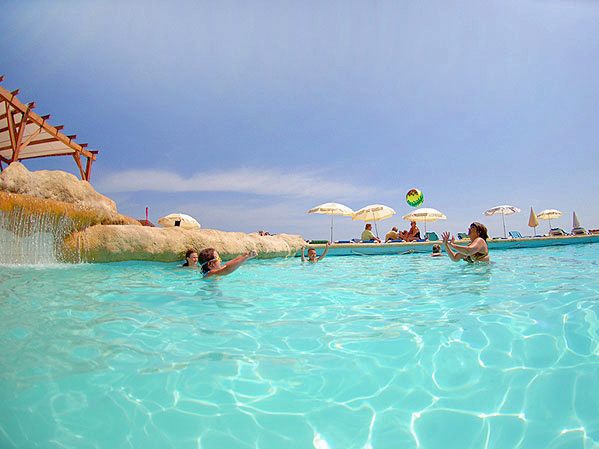 All water sports activities take place down at the Preluna Beach Club. This is an exclusive pool area down by the sea that is only for all-inclusive guests at the hotel. With a kiddie pool only 0.5m deep and a large adjoin salt water pool, there’s enough space to do a few laps and get the snorkel out. But luckily for guests, there’s a host of exciting watersports to try out. The main watersports activity provided at the club is a scuba diving school. This is a mini condensed course which is perfect for anyone who hasn’t had the chance to give diving a go but has always wanted to. The training is carried out by a Padi Certified instructor who can quickly get you to grips with what to expect from diving, what safety measures to take and how to make the most of a dive. If diving or snorkelling is a little timid and you prefer your watersports to be more adrenaline fuelled, you could also try your hands at water skiing or jet-ski. With its prime sea-front location, the waters out by the bay are well known for being incredibly clear and on a good day (which is mostly every day in Malta) you can go out on a jet ski and see the island from a different perspective. You can even take that idea to the next level by signing up for Parakiting (available on request). You can reach soaring heights as you glide along and soak in the atmosphere of the sea below. Windsurfing is also available. The sea front itself isn’t very choppy so it does make for smooth sailing and less of a chance to fall over if you’re only new to this activity. Speaking of activities, if you’re planning on staying at the Preluna Spa & Hotel, you’ll want to know about all the places in Sliema to visit and the best transport options for getting around town too. And for anyone who wants to keep on top of their fitness routine while away from home and doesn’t fancy laps in the beach club pool, there’s also the indoor heated pool at the spa centre that will help you smash out a quick cardio session in no time at all. To find out more about the Preluna Hotel & Spa please click here.